How well do you think you could describe a bible character just based on events and moments in their life? 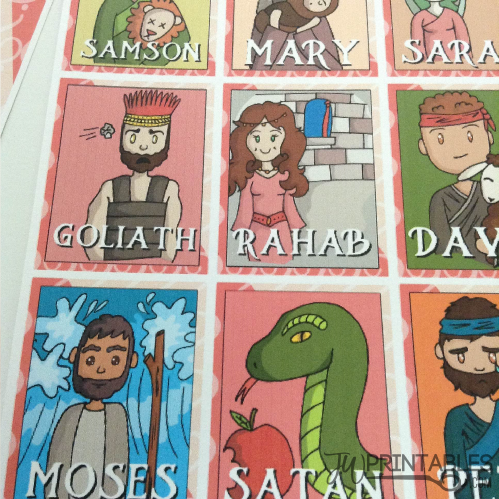 Or how easily do you think you could guess a bible character based on just a few hints or phrases? 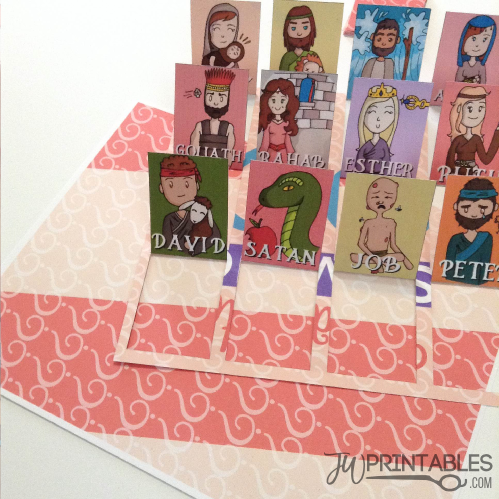 This printable game, “Bible Guess Who” was a fun family worship project we decided to try. It works very much like the original guess who game (if you’ve ever played it) but with a few differences! Two players are each given a board with various characters on it. 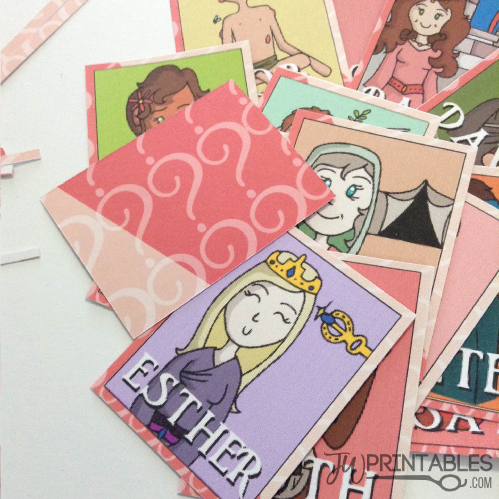 Each player pulls a card from a deck which indicates which character is theirs. This game is similar except for a few differences. 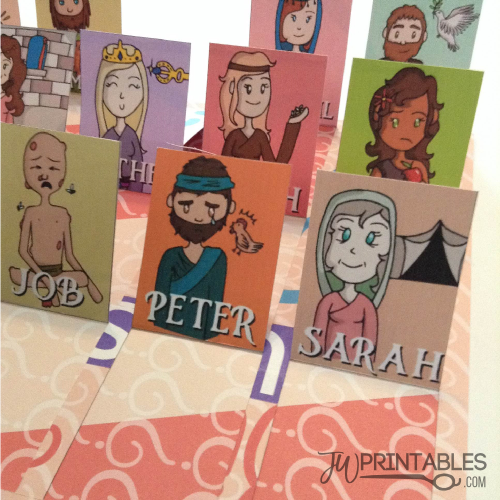 Instead of guessing based solely on physical attributes, the object of the game is to ask questions about different events in the lives of the bible characters on both boards. Oh, also each board has the same characters in different arrangements to make it easier for both players to guess a character. Depending on the response of the other player, you can push down characters that you think aren’t the one your opponent has until you come down to 1 single popped up character. You can guess at the end when there’s one char left or decide to guess in the middle of game play if you really think you know who it is. Just know that if you guess incorrectly the other player automatically wins. Also know that if the other player guesses correctly before you do, they win! I hope that makes sense! You can also ask questions like “Is this person male or female?” and “was this person old or young?” if you like. 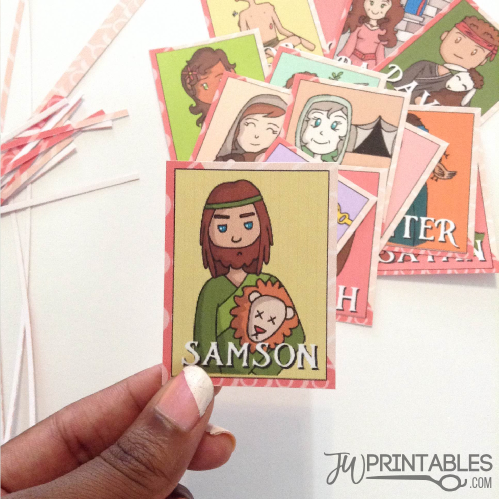 When we play we try to focus on life events and special things highlighted in the Bible about the character. This is a little more time consuming to put together than most of our projects, but very simple and easy. We’ve taken careful time to make sure assembling this isn’t too hard. It took us about 2 weeks to get everything perfected but the final result is SO much more simple than our first draft ideas on how to pull this off. 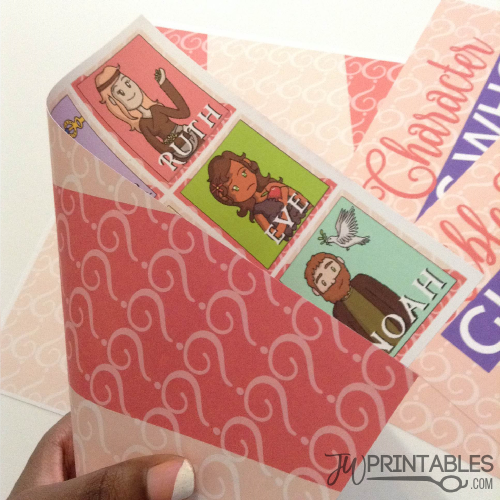 This project features double sided printing. I’ve separated this download into 4 different files so that it’s easier and less confusing for you to print the right combinations on both sides of a sheet of paper. You’ll end up double printing 3 sheets of paper and having 2 sheets that are printed on one side. I specify which pages should be double printed when you download at the bottom of this post. I also printed the 3 double sided pages to the edge of the page instead of normal printing. For more detail on how to do full page printing refer to this post. 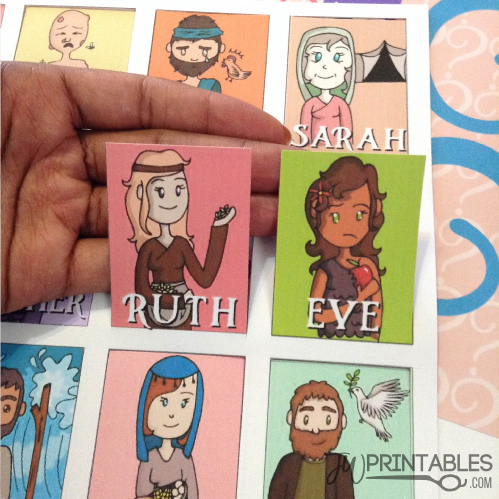 Of the 3 printed pages, one page will have characters with this decorative edge on them. These are what will become the character cards that each player can pull from to determine which character they will be. These will need to be cut along the edges into rectangles to make the cards. As this above photo shows, the cards will be double sided if you properly printed on both sides as indicated above and specified near the download links below. You can put these neatly into a pile and set aside -this part is done. Next you’ll want to move on to the the two double sided game boards. As you can see in the photo above these have no decorative border (this is how you can tell the difference.) Also each board has a different arrangement of characters. The board characters will each need to be cut along ONLY 3 outer edges with an x-acto knife. The bottom edge (where the characters names are) should not be cut. Those will need to be scored so that they bend easily. This will allow us to turn each character into a flap that can be pushed up or down. This is pictured below. 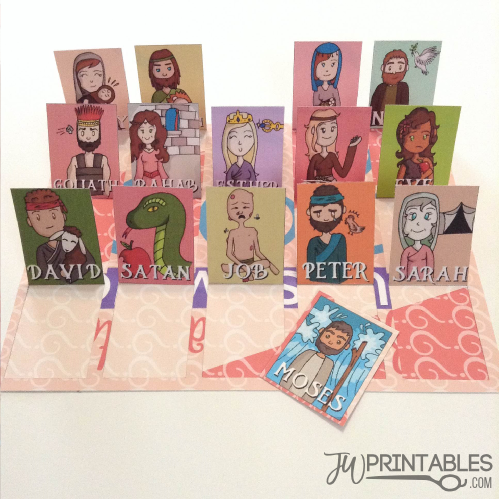 You’ll want to fold so that the characters pop up as pictured. Next, we’ll need to glue the only two not double-sided pages onto the bottom of each game board as shown in the photo above. This will give the game some stability since there’s so many cuts in it. When you’re done gluing the little spaces it should look something like below. Do this for both game boards and you’re all done! 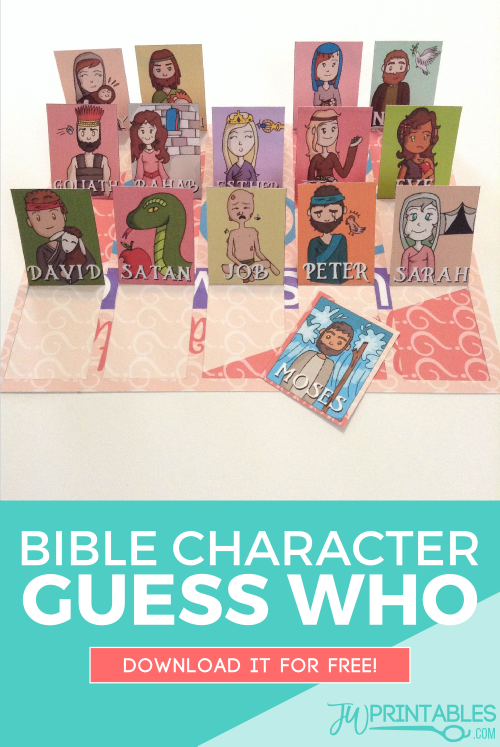 Now you can play Bible Character Guess Who to your hearts content. To get these for yourself, download below! We’re really excited about this but the first game board won’t download. Says invalid download! Thank you! Our family truly enjoyed playing the Finish the Race board game. We had my mother and brother over as well and we adapted it according to ages. My daughter 7, my son 13, brother 19. For example the older ones would find a scripture in the Bible that talked about which spiritual armor a player used and discuss how it protects us from Satan’s attacks. Thank you so much for this beautiful spiritual Game. Much lI’ve from your brothers and sisters of the Springfield, MA North English & South Spanish congs. Our grandchildren loved the The Paradise Times. We did this for family study tonight. does this come in black and white? It does not. BUT you can adjust your printer’s settings to print it out using black ink only which should do the job perfectly. I try to print out but will not print. It’s a little difficult for us to troubleshoot your printer since we’re not there, but please double check that your printer settings are set to color and that you are not out of printer ink or anything like that. 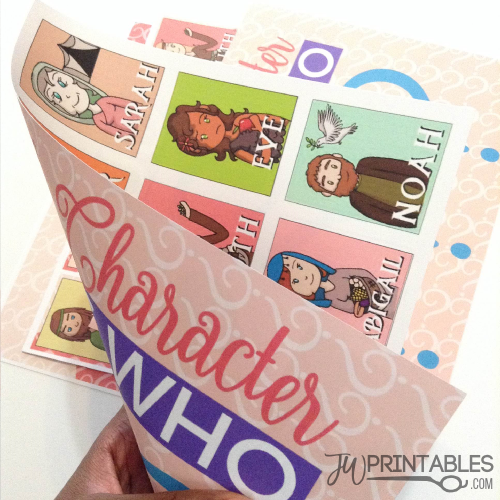 Do you think if I laminate it, the characters will stand up? 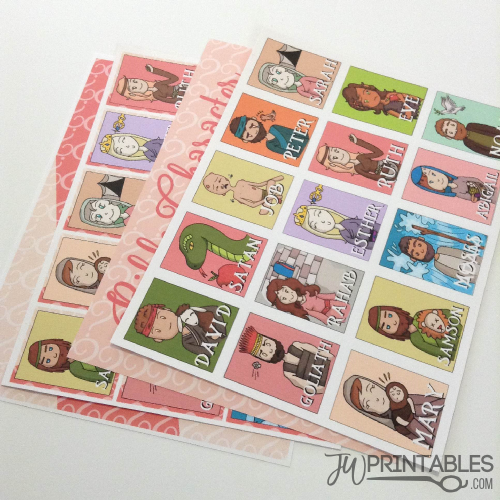 The characters will stand up without lamination. The photos in the post are un-laminated and they stand up just fine for us 🙂 Not sure if laminating will impact if they will stand up straight or not, but it’s worth a try! Let us know the results if you try it out! Thank you so much. Will play this with a four friends who are coming over this weekend. My Godness! It´s amazing!, I´m going to use in a junior´s meeting and I´m sure the´ll enjoy a lot. Thank you Brothers an sister for this lovely resources. Jehovah still blessing you. XOXO from Mexico. I’ve been teaching English to a group of kids in Brazil and finding this website has been a blessing for I now have good quality material to teach them based on Christian principles and the Bible. This game does not fit the standard guess who game, it is a self- contained game all in itself. Tutorial & instructions no how to put this game together and play can be found in the post above. Agape!